Need a roof repair or considering a replacement roof, or have general questions? Great! We are here to help. Thirty years of roofing industry experience, we are licensed and insured, have expert staff, and a reputation which speaks for itself. Whether you have questions about cedar shake roofing, asphalt shingles, architectural roofing, other roof types or services call us today! Your building in need of a roof repair or a roof replacement? Let us help with your roofing project. It is less about the building or business you own and more about the type of roof on your building. Perhaps you are wanting to replace your roof and have questions regarding staying with the type you have now or an entirely different type of roof. Chesterfield Roofing specializes in residential and commercial roofing services - roof repairs, roof leaks, re-roofing and all phases of the roofing process is our expertise. Call today to speak with a roofer about your roofing project. Whether you want to have architectural roofing shingles, or shingles to fit your budget without compromising protection of your home - you have come to the right place. Call us today and let our experienced technicians and staff work for you! Ask about our product and labor warranty. Chesterfield Roofing specializes in all phases of the roofing process in Chesterfield, VA and surrounding areas. Let us provide the highest quality of craftsmanship for all services provided such as complete roofing repairs and roof installations. Let our qualified roofing specialists and knowledgeable staff provide excellent service from beginning to end. 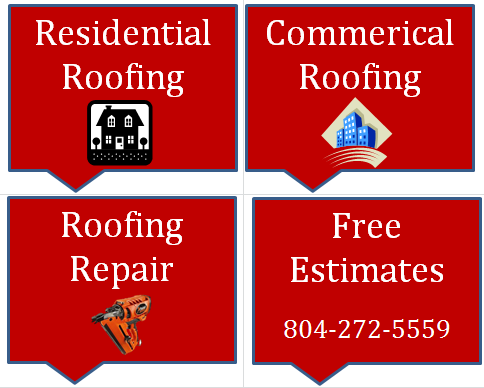 We have over 30 years of providing local roofing systems to residential and commercial clients throughout the tri-cities in Virginia. roofing company that fully licensed and fully insured. Customer service is first priority, that is the foundation to showing you we care about our clients. We strive to provide a craftsmanship you will talk about for years to come! Our customer first approach is what allows us to stand out from the crowd. We understand there are countless roofing companies to select from. Let our family owned and operated company offer you the best roofing services! We are locally owned, we are family owned and family operated. Residential specialists. Re-roofing experts. Over 30 years of experienced in the roofing industry. No roof project too big or small. We offer a vast array of roof system types and services. We guarantee excellence and quality service in all that we do. We provide services ranging from roof repairs maintenance and complete roof overhaul. Let us work for you! Chesterfield Roofing is family owned and operated with more than thirty years of experience in the roofing industry. We are fully licensed and insured; let our services solve all your roofing needs with technicians who are knowledgeable about the roofing industry.